Now it’s time to rearrange my wardrobe and my basic cosmetics. It easier to change product according to the season so it’s much easier to take care of your skin. I don’t really have dry cheek so I use a lotion or moisture essence that functions well. When I feel the limitation of the lotion I use moisture essence. While the cream had a perfect peach smell this smells like peach with strong stingy scent. I give more points to this compare to Shu Uemura moisture essence in terms of stickiness. My friend who were using Shu Uemura essence liked this better because there isn't any stickiness. When you apply, trace of stickiness evaporates and it leaves only soft and light feeling. 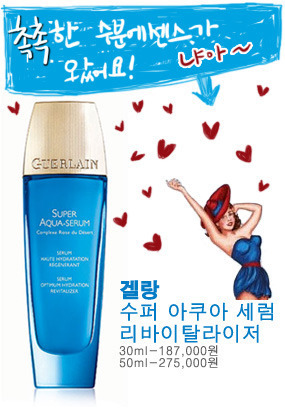 This has special ‘Booster effect’ that helps other moisturizing cosmetics to function well. However I don't feel any difference. Instead of applying moisture essence with moisture cream, purchase the best moisture cream that is worth more than buying one more item. If you have a cream that works fine, don’t change. I also want to recommend this to other group of people. People who are so oily that they feel it’s too much to use gel type moisturizer. Saying it’s moisturizing product, it doesn't only contain moisture but it also has some oil. People who want to apply moisturing product like lotion or essence, or cream, but can’t which one, this might be a choice for you. If you felt too oily or heavy this would work with caring moisture and balancing the oil and moisture. After using a toner, eye cream and finishing with this serum adding sunscreen would feel very light. Oily skin type should end with moisture essence. Of coarse according to the skin type if you feel it’s not enough use another product that satisfies your skin. Even for people who have average or mixed type skin they might feel cream is too much for them. Applying cream, sunscreen, and makeup base, might feel too much. So using cream only at night is better. During the morning finish with essence. If the price is too expensive check other inexpensive product. However I can’t find a product that can use alone satisfying the skin. So this is the product that provides moisture using only this. Your face would feel much lighter. Be careful not to rub your face strongly after applying this. I think the soft feeling might be the silicon base. However there's no need to worry about how your makeup would settle. Mac strobe is one of my favorite items. I don't really use make base however this is like a lotion that have fine glitters. It doesn’t really give coverage or revise the skin tone but this functions well as a skin care. When I feel really lazy, I apply sunscreen right after eye cream. I don’t feel dry for a day and feel very comfortable and light. So I asked my friend who works at the lab if it's all right to apply sunscreen right after toner. So I am saying that you don’t have to apply so many cosmetics for the skin to survive. Lets throw away the stereotype. This moisture was launched on 1987 having very deep history. However the price is too expensive so I was just looking at it and wishing to use it. It said to be sold 1 in every 2mins according to Guerlain. This is how very famous it is. Also many bloggers said that this lasts for 30 hours. I tested many times on my hand but couldn't feel it. So I had to try out myself to see the effect. When I applied to my face, I was surprise! It was more like oily lotion or cream type. I was thinking of cool effect by the blue color container. It made no difference! It's like a lotion and feels little bit sticky. You can’t really feel the difference when you wear makeup maybe only sensitive skin can. However there aren’t many people who won’t wash their face for 30 hours. Maybe this will be a great hit during the evacuation in war. I don't really wear makeup but only on special days. So I was using this consistently and check the effect. Moisture creams of other brans had the initial feelings after applying gone within several hours. However with this moisturizer the feeling stays even after several hours. I can feel the moisture but at the same time little bit of oil. So I do not recommend this to people with oily skin. This also has some condition to be used alone. People who are averagely oily or dry would be satisfied with this because it contains enough oil and moisture to be used alone. If the price too much, divides the payment with your mom, it’s a product that can be shared. To those who are already satisfied with the item that you’re using, you don't have to think about buying this. This has really great persistency but it can be done with the mist when you are revising your makeup. There isn’t any great difference. Recommend to people who want to use only one moisturizer or to those with very dry skin.